This is a nutritional muesli, which is non-heating and specifically formulated for the maintenance of horses or ponies at rest or in light to moderate work. Stonebridge Cool & Condition mix provides essential minerals & vitamins that are vital for a healthy diet. It is a highly palatable mix, blended with our own blend of natural flavourings and essential oils. 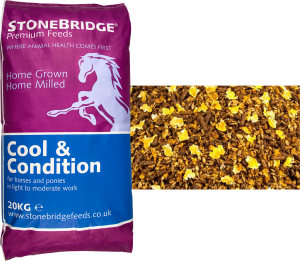 This is a complementary feed to be fed in conjunction with suitable forage to ponies or horses. available Bioplex Organic Minerals and is rich in vitamin E & selplex. Rich in digestible calcium, trace elements and vitamins. Calcified seaweed has an excellent acid absorbency, to maintain stable pH levels in the digestive system and helps to improve fibre digestion. Palatable and helps bind the vitamins, minerals and spices etc.